The new white Biotech DEGASi Compact is a new line of stand alone degassers which combine the cutting edge Systec technology with a very small footprint at an affordable cost. 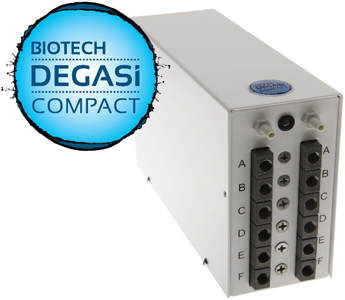 DEGASi Compact is available with 2, 4 or 6 degassing channels in a housing with only 167 x 56 mm footprint. This is possible due to the development of a new single stage vacuum pump with a small built in control board and new 285µl Systec AF vacuum chambers. Closed-loop control with a continuously running vacuum pump gives a very smooth baseline. The speed of the pump is varied to maintain an exact vacuum level inside the vacuum chambers. The degasser is equipped with built in error detection functionalities. A bi-color diode on the front panel gives information about the performance. The extremely low internal volume of 285 µl provides very fast priming and start up. Despite the small size of the unit it has an expected life time of more than 6 years.